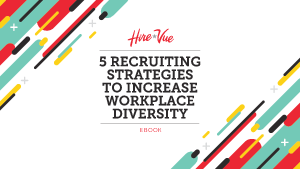 Recruiting leaders know that if their companies aren’t sourcing and hiring for diversity they are missing valuable talent and experience. This is one of the reasons diversity has been a focus area for improvement in recent years. This has put talent leaders in a dicult position. The way to make real progress on diversity hiring initiatives is by using systematic processes that apply data-driven decision making. With structured interviews and AI, you can overcome unconscious bias and make hiring more equitable for all candidates.